Is it almost the same thing if you use your knuckles? I feel I have way more control that way. I mean those knuckles between your fingertips and the bigger knuckles, whatever those are called. johndoe1225 wrote: Is it almost the same thing if you use your knuckles? I feel I have way more control that way. Here are some update photos 4 1/2 months into treatment. Nice to see others adding to the thread. 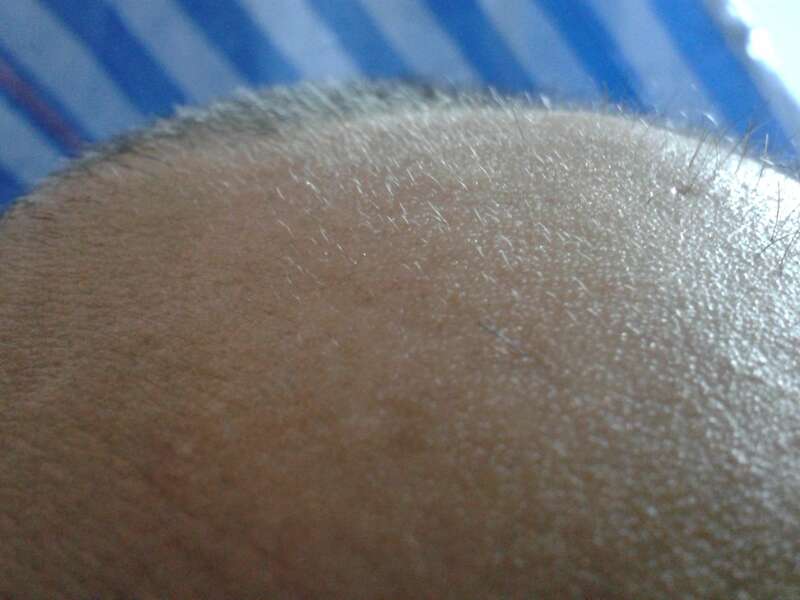 As for looseness I am surprised that my scalp has not gotten very loose and flexible on the top. 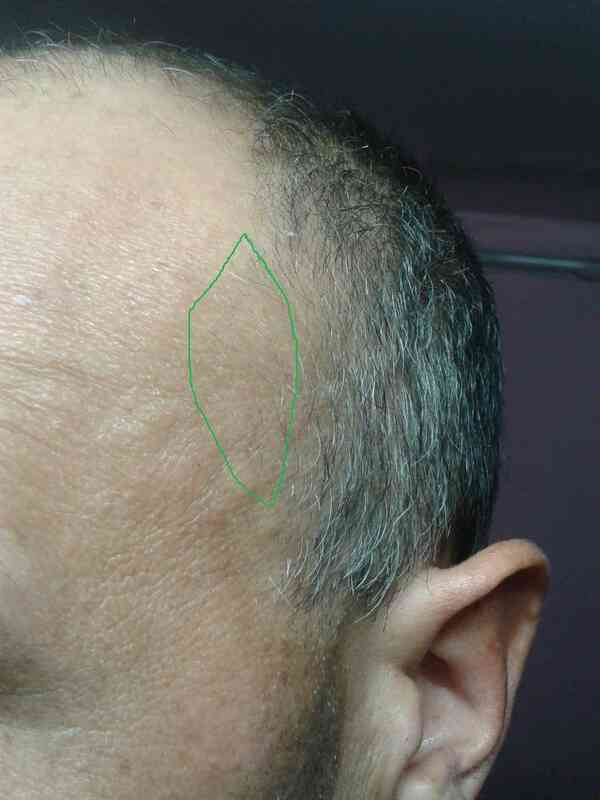 It is healthy and firm, not noticeably loose anywhere including forehead. 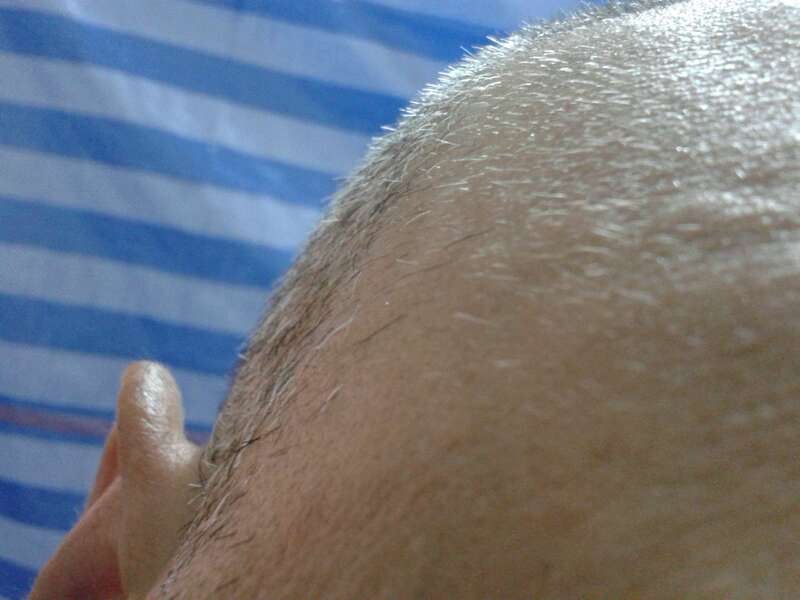 I have not been too active with pictures because I shaved my entire scalp to zero hair 2 weeks ago. This gives us a chance to take a look at the hairs that are really growing in thicker and quickly, and filter out the slow growing fuzz. I dug up some past photos from this thread to compare with. 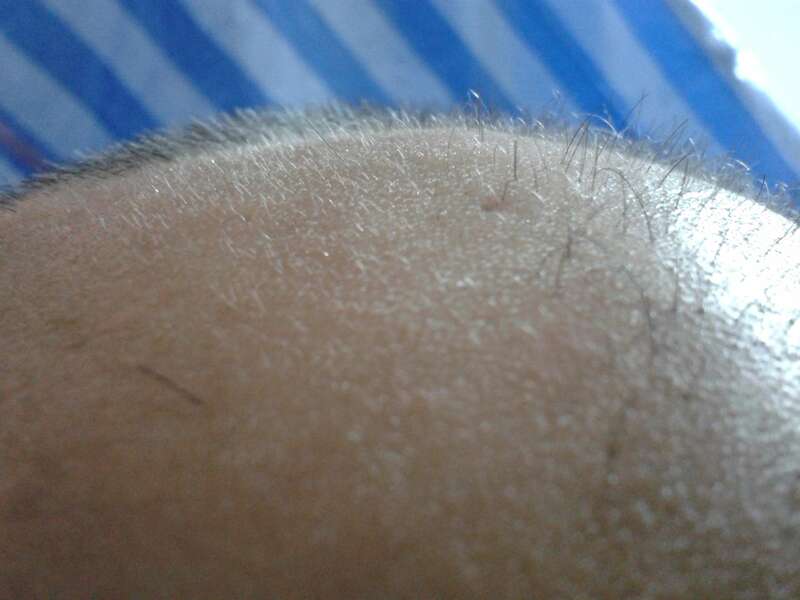 Basically the handfull of solid visible hairs represent the front runners of a base of thickening hairs that are harder to see with the direct light (or short due to the shave ). The first set of comparison old photos show clearly how slick bald the area above my temples was. If you want to see the level of fuzz and new hairs in this area, see the last set of photos I posted before the shave. 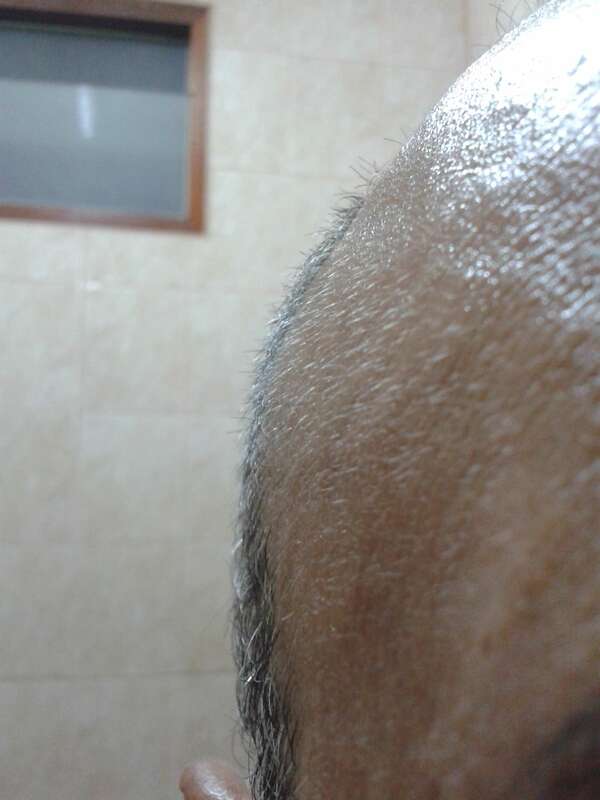 You will see a few light thickening hairs in todays new photos also. Try to right click and open these in a new tab. Here are basic old side shots to compare. These old photos are just a few weeks ago, not from the first 2 months, or very original starting state. I put some lines to reference. 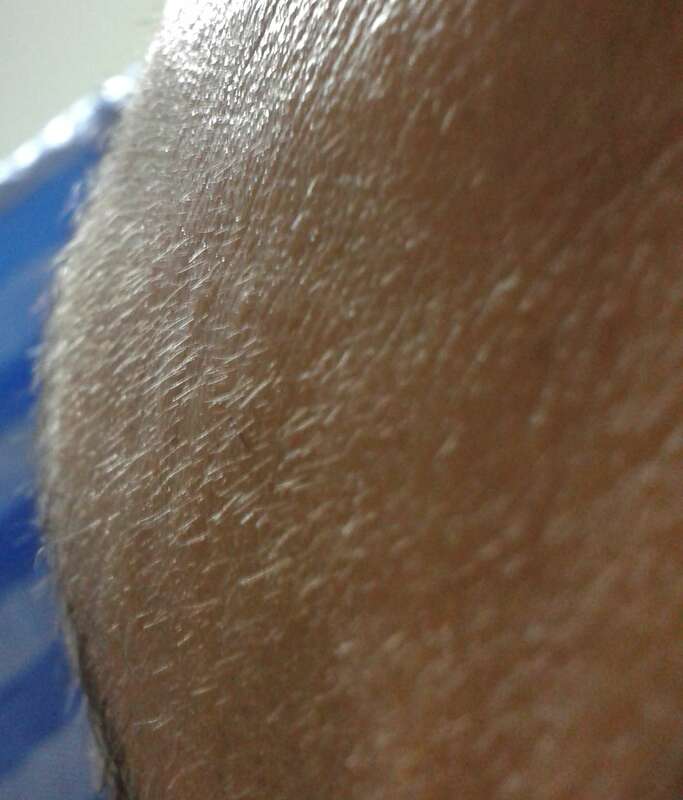 Remember these are 2 weeks after a zero hair shave, what you see has established a real grow cycle. I am pretty sure that my V area has grown in at least a 1/2 inch forward on one side (not the side pictured). It is not easy to document this, but someday I will have the overall growback to show I think. You really think you will recover with that ?? He is only four and a half months into treatment, he shouldn't even be seeing hairs sprouting up yet but he already is. These are promising signs. I am sure this is why many people do not stick with even working hair treatments, it does seem like a slow road to the thousands of hairs needed to really get good coverage. 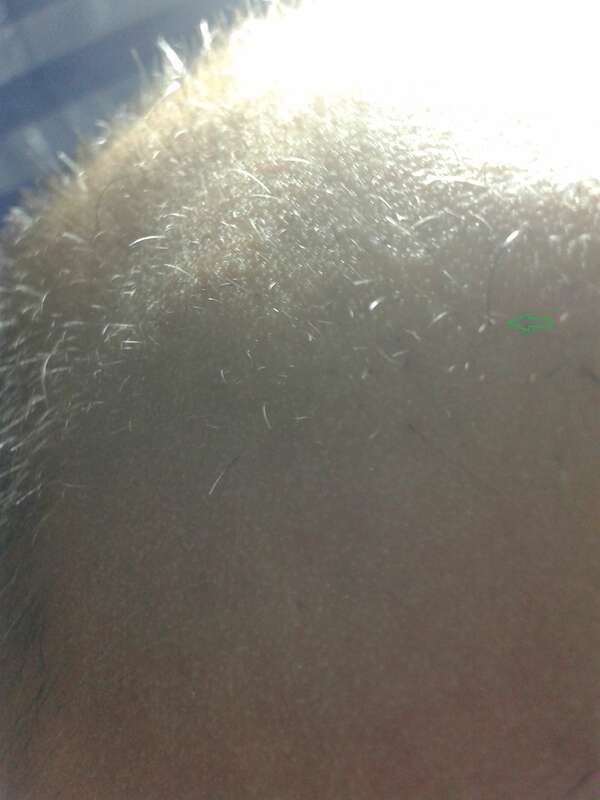 With the complete shave a few weeks ago the smaller mat of thousands of hairs that have entered a growth cycle and are thickening daily, are not seen. It is in this base of thousands of new hairs that the hope of a reasonably quick and good coverage remains. 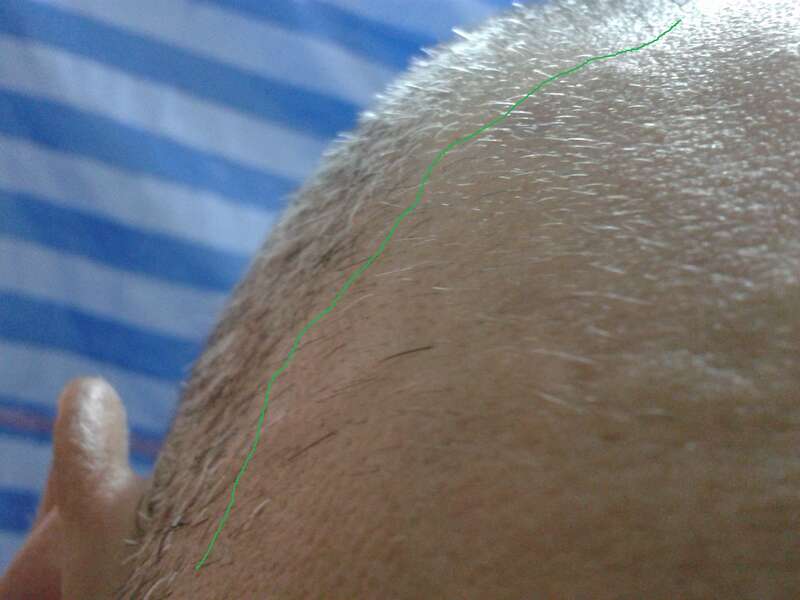 That is kind of the point of highlighting how slick bald the area above my temples was a few weeks ago. To have now thousands of hairs entering a real growth rate across the area is kind of amazing. 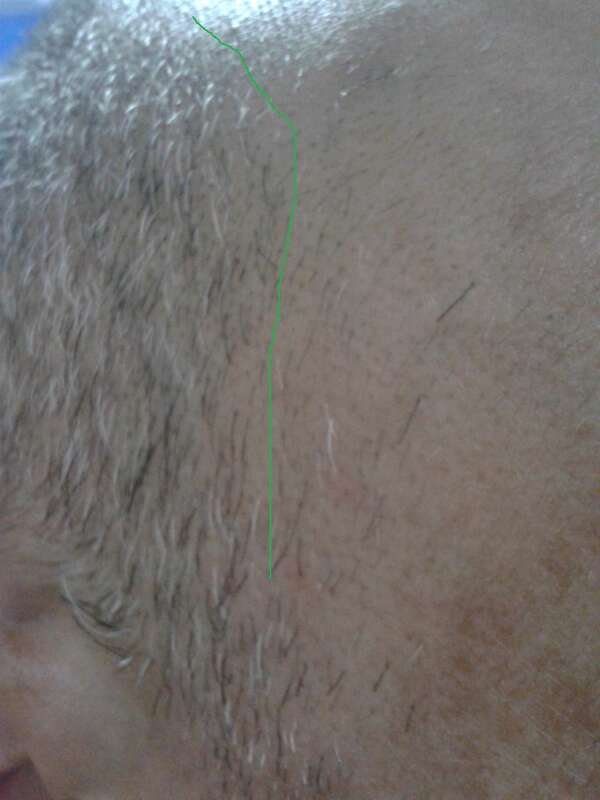 Also there are plenty of real hairs covering well at the border areas of the pre-existing hairline, but it is very hard to photograph that and know what is new growth, thinning hairs, or just patchy hair. Anyhow when your hair is as far gone as mine is I do not have much to lose with this treatment. The best thing is that my scalp is really finally healthy. 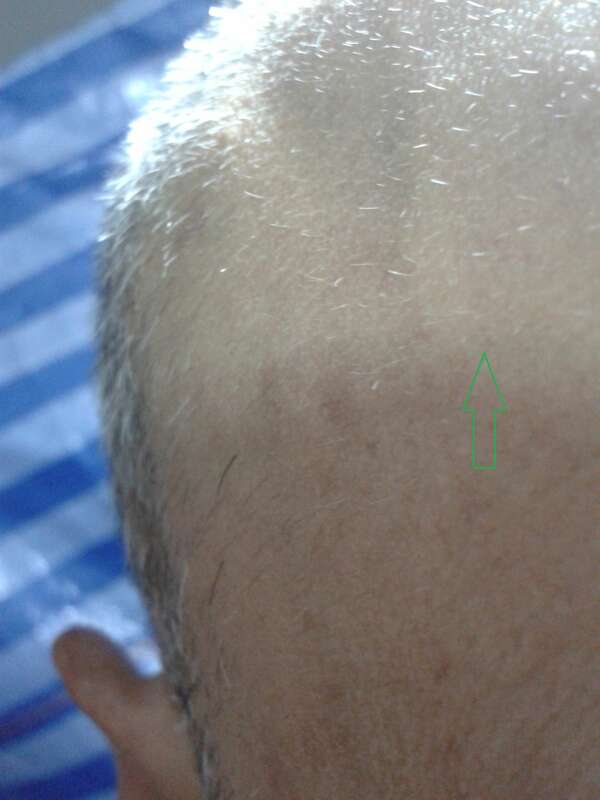 It does not have much for painful areas, an area on the back crown that I thought might have been pre cancerous from surf and sun has completely healed. After the pain is gone the head massage is mostly relaxing, I do my neck and face too. In the end, I am glad to have something to photograph every few weeks as progress. I am glad the changes are enough for others to measurably see. Maybe someday this will be a basic spa treatment for anybody's hair. Perhaps even celebrities will be doing something like this to keep their hair healthy. thank you cdto2012 for sharing your method with us , i believe you even without a pictures , and i think seuxin must try it him self for a month or 2 before he decide if it work or not . if you melt the calcification/sebum mix they will possibly go to blood stream giving a space to a new blood vessel to grow and branch ,also give a space for follicles to enlarge freely and producing thick dark hair . So....i will try on my left temples ! Using plastic tool once a day ( don't have time to use twice a day). long hair wrote: thank you cdto2012 for sharing your method with us , i believe you even without a pictures , and i think seuxin must try it him self for a month or 2 before he decide if it work or not . Don't get me wrong, I don't understand all this hassle when simple magnesium oil does exactly what you're doing here...de calcification, pain free and naturally? I just used Magnesium Oil on my scalp for the first time today. Normally I can feel where I have calcium buildups but everything feels broken down since I sprayed the Magnesium oil. Seems pretty obvious one can get results much faster if using Magnesium Oil along with DT. I'll keep using it, and once I have some more money I'll supplement with K2, D3, Magnesium Orotate, Skate Liver Oil, and Thorne Research's Stress B-Complex. I've researched all of those supplements and I think they would be enough for me to halt my hair loss. I would welcome a liquid solution addition. Some posters think that magnesium oil will not do the job. Actually the thread starter has recently joined the pressing method to remove calcification as he posted on the other DT thread. The other things that the massage offers are bulging of the blood vessels for forced circulation, pressing to remove sebum, and micro bruising allowing for a regeneration response. An important note is that if there is a physical crushing of the calcium crystals there is probably some bruising of the surrounding tissues. This brings this therapy into the needling arena. It is important to digest a few thousand milligrams of vitamin C to insure proper and quick healing. For a month trial, at best you may feel your existing hairs get stiffer and healthier feeling. At worst it can be a painful month of shed and frustration. Obviously the benefits are seen after the pain lessens. I did see my first lengthening along my blood vessels in a 2 weeks in an area that had no pain to start with. Thanks to the encouragers on the tread, it is nice to update and be a part of a thread that is supportive and progress oriented. cdto2012 wrote: I would welcome a liquid solution addition. Some posters think that magnesium oil will not do the job. Magnesium Oil does break up calcium deposits. You can look it up online yourself or just try some on your scalp. The guy who made that thread you posted is fond of making baseless claims. People can do DT as hard as they want, if you have significant calcification in your scalp DT won't work as well as it could. Break up the calcification externally using magnesium oil on the scalp. Use K2, D3 and Magnesium in supplement form to decalcify from within. Do those two things and you'll not only start to feel better, but there's also a good chance you can halt hair loss and regrow your hair over time. 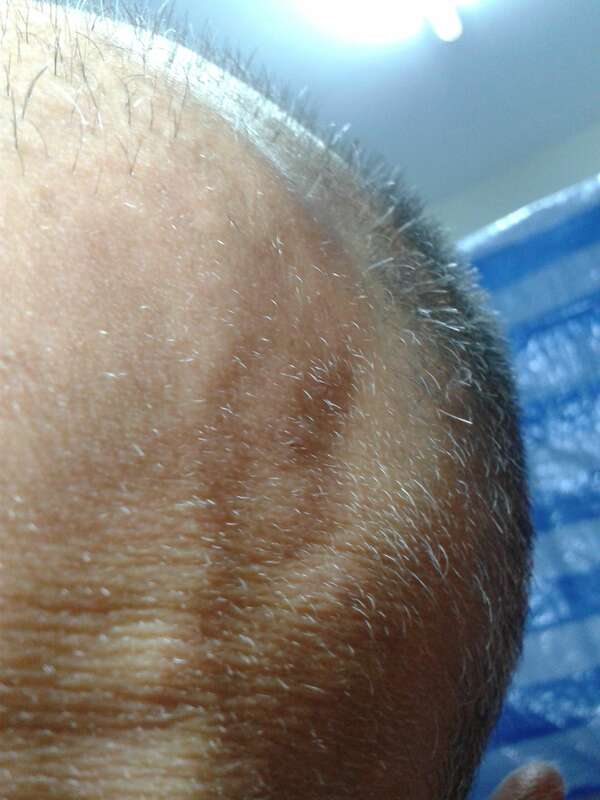 MovieJunkie89 wrote: People can do DT as hard as they want, if you have significant calcification in your scalp DT won't work as well as it could. Break up the calcification externally using magnesium oil on the scalp. Use K2, D3 and Magnesium in supplement form to decalcify from within. Do those two things and you'll not only start to feel better, but there's also a good chance you can halt hair loss and regrow your hair over time. That's exactly why I have asked the OP why all the hassle? I take D3, K2 and magnesium oil and I would prefer taking all those gels and the spray to see results as opposed to pressing my head with the bottom of a bottle on a daily basis. Glad Resistance asked about why go through all of the details of this treatment . 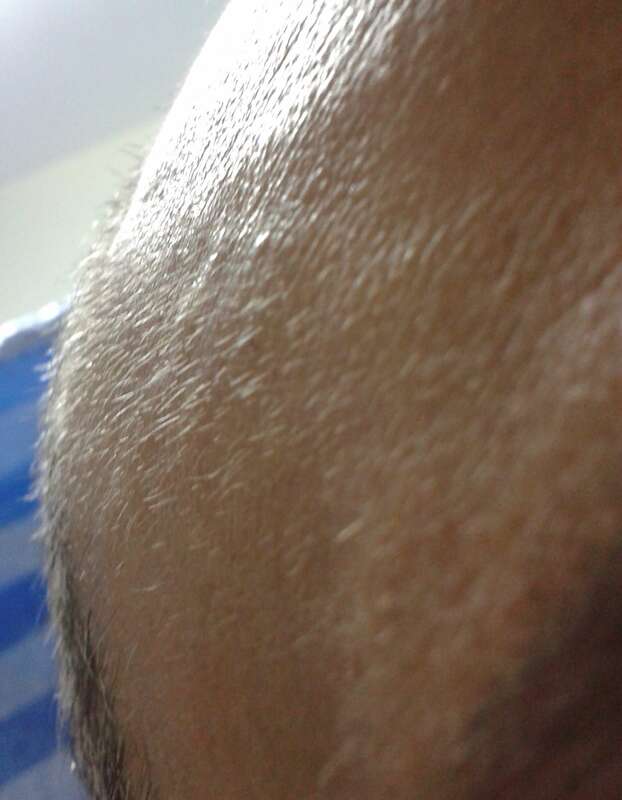 I wanted to have the following definitive pictures to post showing real regrow with the answer. The simple answer is that pressing forces the blood flow and stimulates a healing response. The extended answer is what is missing from this thread. The other very important details of the treatment being used/commented on by others. Once you put cinnamon oil and see and feel the blood flush you will think wow. Once you let your body just defecate for more than 10 days on a juice fast, your body will never be the same. 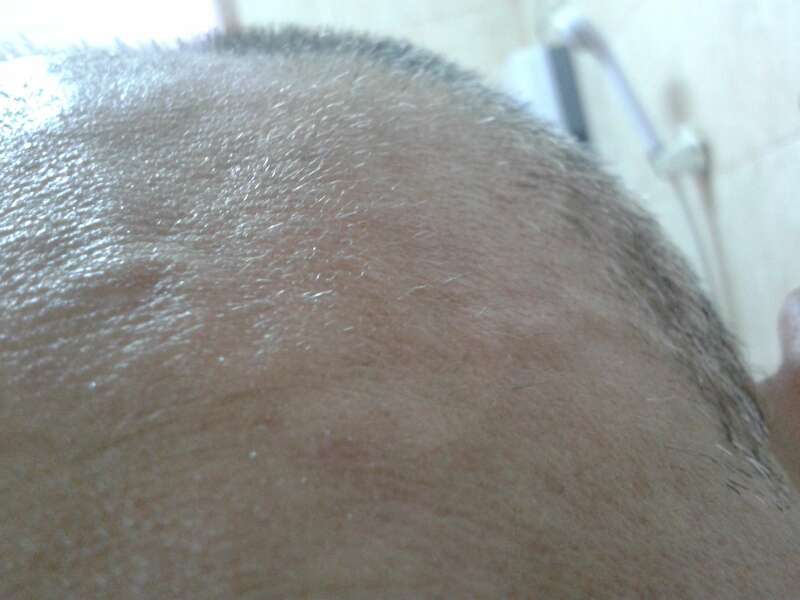 When the enzyme treatment shows you where your weak skin areas are, and heals them, you will not pretend your scalp will be the same without it. To use the tea tree and get rid of mites may have been a huge factor in recovery. Finally there is no replacing the hundreds of hours of pressing to really heal the scalp. The results come in a few few months, reversing years of balding, yes it takes some work while you sit around. For the photos, I shaved all to zero about a month ago. Everything you see will be double the length in another month if I do not cut them. 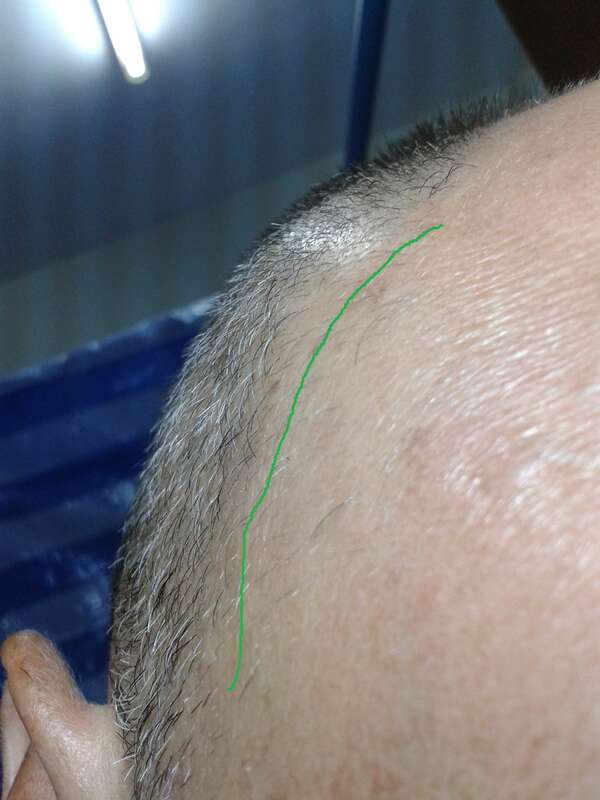 In my last photos post I put up some old example photos to prove how slick and hairless the area above my temples was. In these new photos I try to show that area with the real regrow in action. Right click so they can be seen in a new tab. 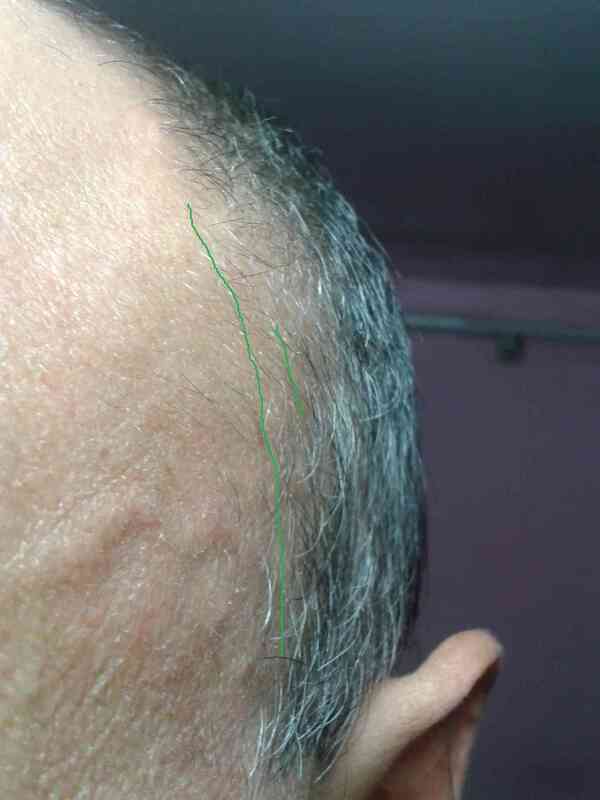 Area above temples showing the regrow in hundreds of new hairs in most all original hairline areas. 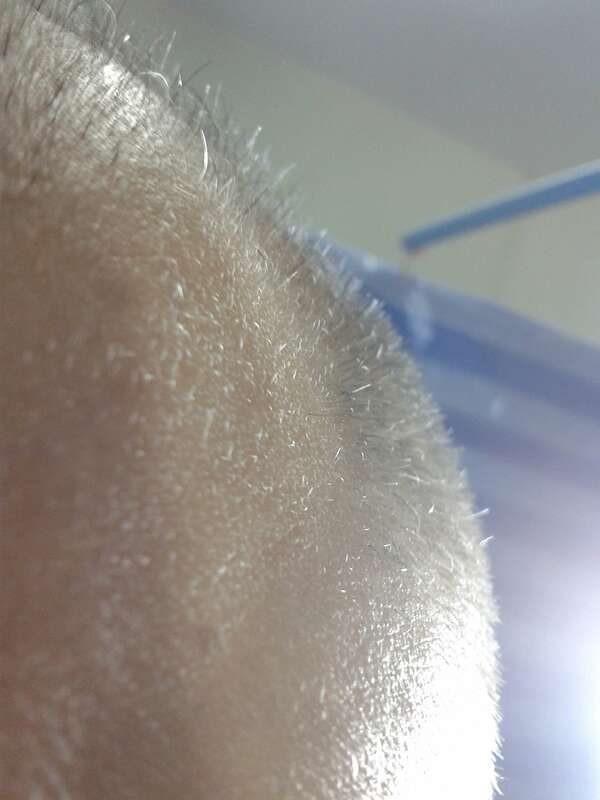 You can see the grafts if you look for them, they are the thickest hairs. Take time for the details and boundary areas, hairs are a job to get focused to show the improvements. 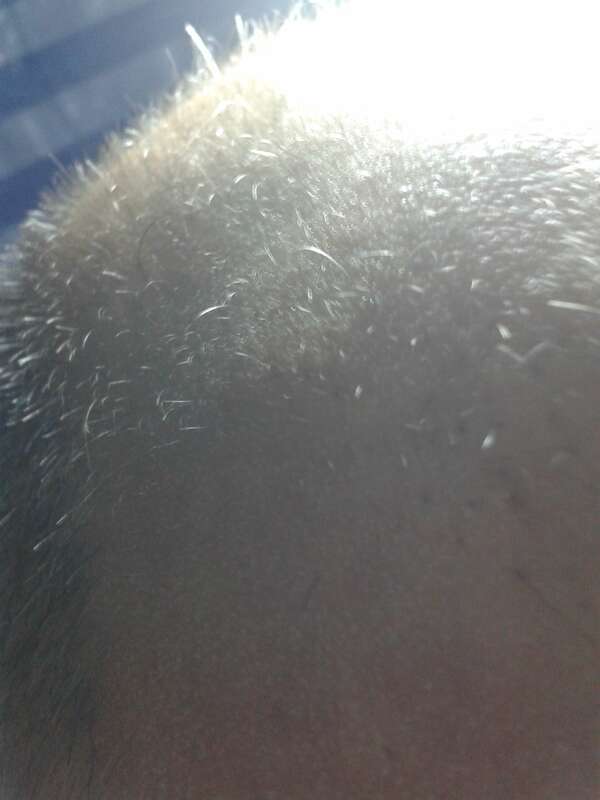 These are the old sides that have been growing back since the first month of treatment , many before photos on the old thread linked on the first post of this thread. Do you really think it help to do regrowth? If you have an alternative, by all means, do that instead of DT. But I don't see there being too many options that are documented to work. cdto has provided you all with proof that this method regrows hair. Yes, it is slow and steady. But what hair treatment isn't? I hope you all realize that even a hair transplant takes a full year for all the grafts to even finish growing in. This stuff takes time, and a lot of it. There is no quick fix unfortunately, its just how it is. Also for anyone still skeptical, I was worried to try massaging with the pill bottle because I thought it would slip, but I tried it yesterday and it works perfectly. I'm starting out slow again though, like maybe 10 minutes total a day. Also cdto, how "big" are the circles you make after you press down with the pill bottle? I mean the radius? Keep up the great work cd. SonofOdin wrote: If you have an alternative, by all means, do that instead of DT. But I don't see there being too many options that are documented to work. cdto has provided you all with proof that this method regrows hair. Yes, it is slow and steady. But what hair treatment isn't? I hope you all realize that even a hair transplant takes a full year for all the grafts to even finish growing in. This stuff takes time, and a lot of it. There is no quick fix unfortunately, its just how it is. Very well said. Thanks for the commentaries of reason. Like I said before, it is too difficult to convey by photograph the 1/2 inch full progress forward thick fill in at the V area. Borderline photography and measurements are quite difficult. I can do it on the sides due to the spread out and patchy look of the progress. 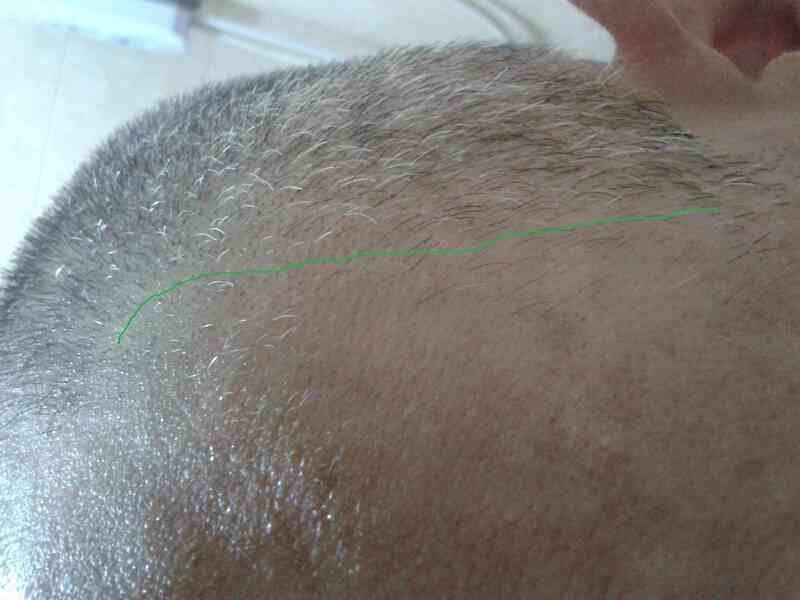 There are hundreds of full width hairs that have filled in the borderline, but you would not identify them in photos. The jump from thickening hair mat to many more full length/ width hairs is around 3 months. 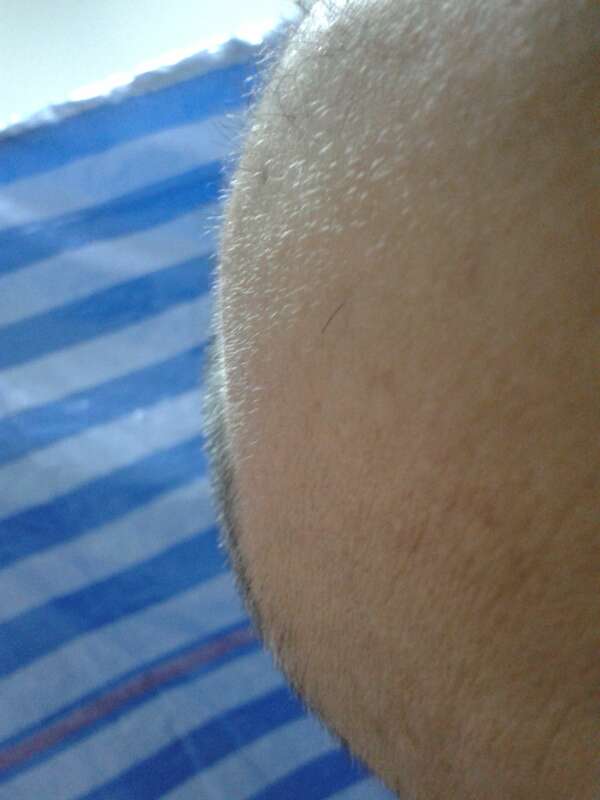 In the end I expect my youthful high density hair restored, that is like 50k in hair transplants to get half that density. I do think there is a possibility that in another 6 months I will have a decent but patchy restoration, maybe like the guy with the glycolic and massage photo previously posted. 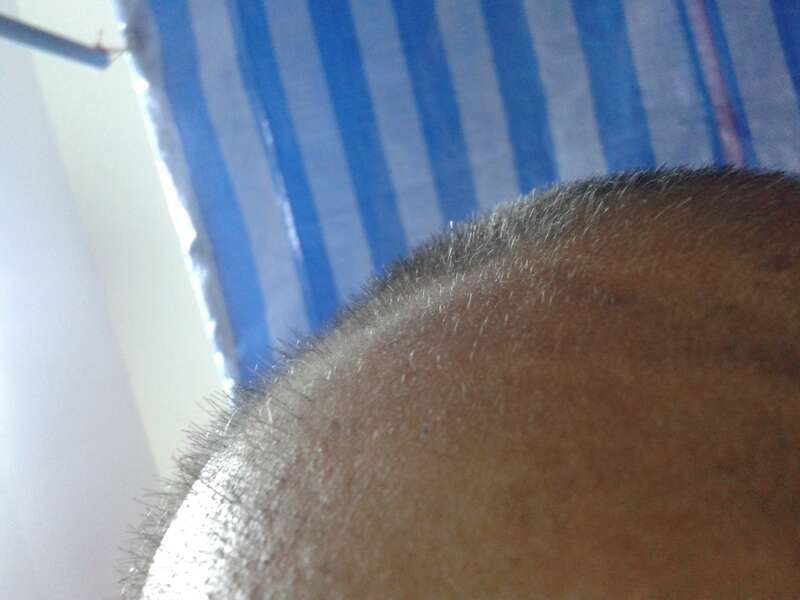 You can also see from my semi useless grafts, that unless you are going to get a major hair transplant the results are on the thin and disappointing side. 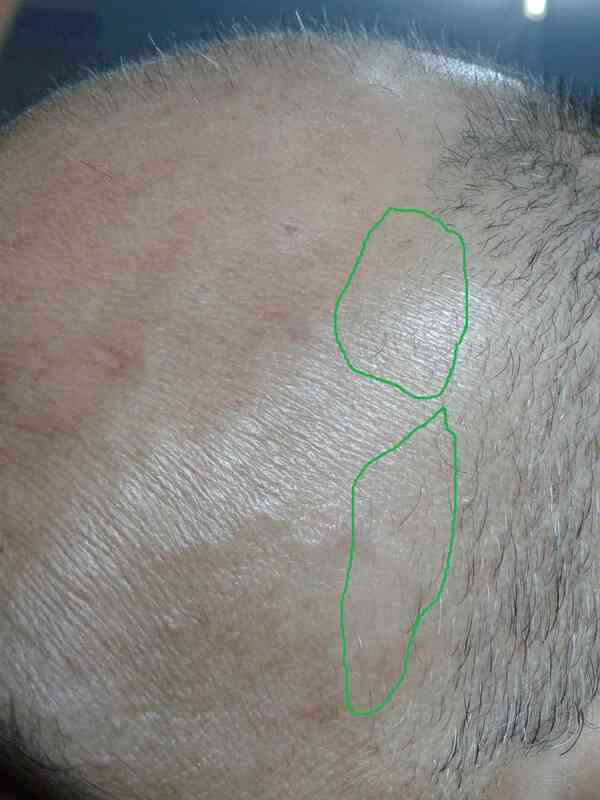 Also my scar from the transplant makes the hair below it patchy, due to blood flow reduction. 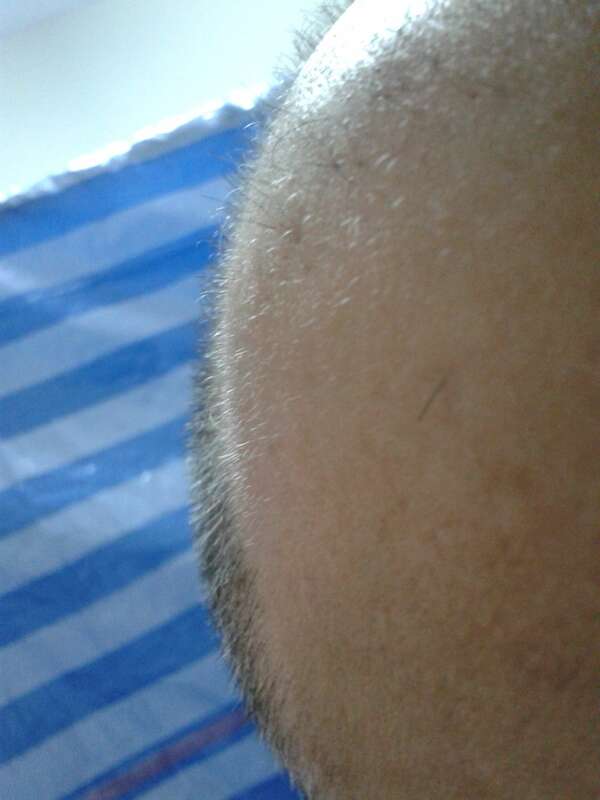 What is really on my mind is that I photographed, posted, and noticed a thicker area of lengthening hairs on my forehead. Tonight I realized that this patch of regrowth ( longer than surroundings ) is following a major blood vessel. You can just see the lighter outline of the vein in the photo, running upward a bit to the left of the arrow. This is what happened on the sides previously, and now there are some full grown hairs there 4 months later. So for sure, this about the circulation issues and forced regeneration (hence the DT-CPR name). I have added some rolling of the sides of the bottle above the ears to press that blood upward. If any readers are members of other hair forums, and you see the value of this thread, please post this a link. I want people looking for answers to have a chance to consider for themselves. Even if this just slowed/stopped my balding rate, that is so valuable to many. Whilst I don't do this routine and don't intend to, I would like show my support on this thread, do not get put off by other users who criticize your workload for such little progress, they are trying to put you off and this is why a lot of people vanish from forums. You are documenting your progress and you're doing it well, keep it going. Resistance wrote: Whilst I don't do this routine and don't intend to, I would like show my support on this thread, do not get put off by other users who criticize your workload for such little progress, they are trying to put you off and this is why a lot of people vanish from forums. You are documenting your progress and you're doing it well, keep it going. First of all, keep up the persistence cdto2012. You are doing a phenomenal job documenting meticulously with sufficient precision naked to the eye of an insect. This takes an extraordinary amount of effort, patience, and time to make sure every photo is crystal clear and consistent. Hats off to you my friend and congratulations on your slow, but steady progress. You are an inspiration and I hope you don't let the negative, pessimistic comments hinder your mental stamina. Just a quick word of wisdom based on my experience, dermarolling is KEY in stimulating quick terminal regrowth. I can't help to reemphasize this point over and over. It is about to be 9 months for me and my temples are about 85%-90% FULLY regrown from a state that was previously 50-60% full. I think the biggest reason why maybe some people were not experiencing any success with dermarolling was that they incorrectly performed it more frequently with much intensity. The key is to wait at least 14 days before starting your next dermarolling session without causing severe bodily injury to the scalp for better recovery. I usually have a few tiny blood spots after each 14 day (~ twice a month) session. Subsequent to each dermarolling session, I also usually rest for two days before massaging or performing DT. I hope this insight provides for a deep perspective on understanding the importance of properly dermarolling! I saw a video on YT awhile back where a guy was just rolling the DR across his head quickly and not actually using much pressure, so as not to draw blood, he said this way works as well, maybe not AS well but...Just like a stimulating effect, or something. I do this thing where I take a boar bristle brush, and tap (more like smack ) my scalp with it. When I first started doing that after just starting DT it didn't have as much sensation as it does now, now I can really feel it kind of pinching. It must be DT that brought blood/sensation back to my scalp. Needless to say a BBB won't draw blood! Take from me man, I tried bristle boar brushing for 7 months and it worked minimally. I focus my utmost attention on dermarolling because the effect is more profound and penetrable than manual methods. That being said, I still perform DT for maintenance and thickening of existing vellus hairs.